Utilising design modifications from our Luxury Range, a genuine mulberry silk-filled duvet is created for a lower price. The Premium Range was developed due to customers requesting a high quality, genuine mulberry silk-filled duvet at a lower cost as compared to our rather high-brow (but absolutely the best on the market) Luxury Range. The interiors of the Premium Range duvets are 100% mulberry silk, and the same great attention to detail is paid during their production, ensuring you an absolutely top quality silk-filled duvet. They are hypo-allergenic and share many other great qualities with the Luxury Range. 1. Very comfortable - Silk Bedding Direct Premium Range mulberry silk-filled duvets are wonderfully lightweight and comfortable. People are very pleasantly surprised at just how much more comfortable they are compared to more traditional types of bedding. 2. 100% natural - the Premium Range silk duvet's interior is top grade medium-strand 100% mulberry silk and is a totally natural product. No chemicals or anything else is added or used in the production process. Bedding made from the inferior tussah silk, down, feathers, and wool need to be chemically treated before use. 3. Self regulates temperature - mulberry silk-filled duvets from Silk Bedding Direct keep you comfortable over a wider range of temperature compared to other forms of bedding. The silk breathes and allows both excess heat and moisture to escape if you become too hot in bed (so no more sweaty nights) but retains heat on colder nights to keep you snug and warm. 4. Totally clean! - unlike other types of natural bedding that can contain thousands or even millions of dust mites, mold, fungus and other microscopic life (and their droppings!). These cannot live in 100% natural mulberry silk. 9. Natural drape - meaning that it drapes snugly around you. It is therefore much more efficient in keeping you comfortable and snug and the drag of the bedding is less likely to awaken you when changing sleeping position during the night. This is especially beneficial for older people and anyone with arthritis or a similar condition. 10. Very little cleaning required - under normal circumstances cleaning your silk duvet will almost never be required. If necessary a mild detergent can be used to spot clean. Over a long period of time, if it becomes a little flatter from usage, simply air outside preferably on a sunny day. Even after years of usage this should return your silk duvet to a nearly new condition. It is very important to avoid machine washing as this will harm the duvet. Silk duvets that can be machine washed have been chemically treated to make this possible. The chemical treatment destroys many of the great natural properties of the silk too. At Silk Bedding Direct you can always be sure of 100% pure and natural mulberry silk. 11. Hypoallergenic - meaning people with allergies and asthma are not irritated by mulberry silk. This is good for people without allergies too because it means it is soothing to the body. The absence of dust mites and bed bugs makes hypoallergenic mulberry silk-filled duvets excellent for asthma suffers too. Duvets with a 100% mulberry silk interior such as these are a 100% natural bedding. 12. All season duvets - Silk Bedding Direct's mulberry silk duvets can be used all year round. By buying a Summer and a Spring/Autumn silk duvet you actually have 3 duvet thicknesses as the Summer and Spring/Autumn clip together to make a super snug Winter thickness duvet. Its like you get 3 duvets for the price of 2! All SBD silk duvets are complete with our "Easy Clip" clips - these are small unobtrusive and durable clips, very easy to use and unlike button and hook will not fall off after years of use. Another example of our attention to detail and absolute best practice. 13. Longer life - Silk Bedding Direct mulberry silk-filled duvets have a longer life than other forms of natural duvets as mulberry silk does not fall apart and degrade over time. 14. OEKO-TEX Standard 100 Certified - All bedding purchased from Silk Bedding Direct is OEKO-TEX Standard 100 Certified and has the OEKO-TEX Standard 100 'Confidence in Textiles' label attached. 15. Money-back Guarantee - The above points are all true and correct and we are highly confident you will love your silk-filled duvet. In the highly unusual situation that you are dissatisfied in any way you can within 14 days of receiving your duvet use our "no questions asked" full money back guarantee - we will even pay the return delivery fee, you are totally covered. We're sure you'll love your mulberry silk-filled duvet. Mulberry Silk – Why is this Important for Duvets? The silk interior is 100% natural mulberry silk and nothing else. 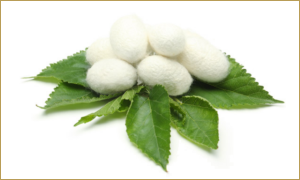 Mulberry silk means that the silkworms that make the silk cocoons have been fed on a diet of 100% mulberry leaves. It is universally accepted that moths fed on mulberry leaves produce the best silk. It's very soft to the touch and besides being hypoallergenic has excellent insulation properties, ideal for making these wonderfully comfortable and soothing silk-filled duvets. 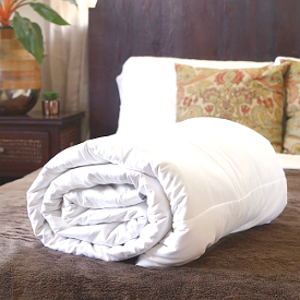 All our Premium Range silk-filled duvets are complete with a soft and durable 200 thread count cotton sateen casing. Although it is possible to use silk for the outer casing this is not recommended as it can tear more easily than cotton sateen. This means it would shorten the life of the duvet while considerably adding to the cost. Using a silk inner / cotton sateen outer combination means you can enjoy the perfect night's sleep for many years to come. The goodness and beneficial properties of the mulberry silk easily seep through the cotton sateen casing. Silk Bedding Direct Premium Range mulberry silk-filled duvets are available in these sizes - single duvets, Euro single duvets, double duvets, king size duvets, continental queen duvets, and super king size duvets. Each silk duvet size is available in 3 thicknesses as all season combination duvets; Light Fill (Summer) and Medium Fill (Spring / Autumn) and Combination Deep Fill (Winter) which is a Light and Medium Fill together secured with our “Easy Clip” clip together system that comes as standard on all our duvets. We firmly believe these to be the very best prices for quality mulberry silk-filled duvets available anywhere. Silk Bedding Direct's Luxury Range is well known as the very highest quality mulberry silk duvets on the market today. The Premium Range makes available genuine mulberry silk-filled duvets at the very lowest prices for very high quality of workmanship and standard of production. As with the Luxury Range each Premium Range duvet is OEKO-TEX Standard 100 certified and has the “Confidence in Textiles” OEKO label attached. The Premium Range are produced in the same production facility and pass through the same rigorous quality control processes as our Luxury Range. 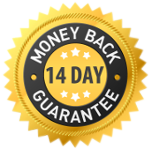 Full "no questions asked" 14 days money back guarantee - we will even pay the return delivery fee, you are totally covered.